In a recent girls high school basketball game at Troy Christian, Kathleen Ahner scored a team-high 11 points in the 42-39 road loss to the Metro Buckeye Conference foe. Ahner’s uniform number had been incorrectly listed on the MBC website, and she was referred to throughout a recent story as her teammate, Maddy Combs. 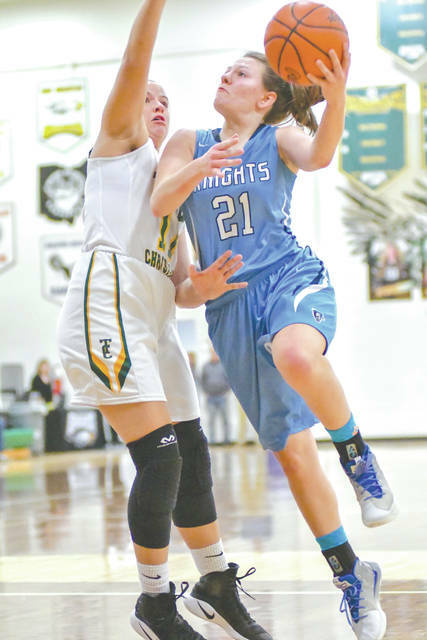 A 5-foot-7 freshman guard, Ahner leads the Knights in assists this season with 3.1 per game. She has also averaged 7.7 points and 5.2 rebounds per game during the regular season.